The first image is a crop from the full frame. Click the images to see much larger and more detailed versions. I have had this camera for more than a year now and I had good results last year shooting comedians for the Edinburgh Fringe Festival. But I have also had mixed results, and a few weeks ago I met someone who also shoots a Fuji X100s. He asked me what I thought of the image sharpness and I said that there was a strange kind of behaviour in some images that I could only describe as almost double imaging that gave shots a plastic look. He said he found the same, and we shook our heads at how we had managed to buy highly-recommended cameras that sometimes gave so-so results. Then about a week ago I noticed a strange thing happening when I opened images in Photoshop Camera Raw. The image would look blurry, as though it had not rendered properly. And then it would just ‘develop’ and turn into lovely, sharp, detailed, rich, rounded, luxurious images. Did Adobe update Camera Raw to deal with the x-trans sensor in Fuji cameras? I spoke to the piper and in the course of our conversation he explained that the reed is a single reed just like in a clarinet. I mentioned that I had read Larry Adler saying that he would blow out the reed on his harmonicas after just one full evening’s performance and had to throw them away. The piper (I forget his name – apologies to him) said he had had this reed for two years. 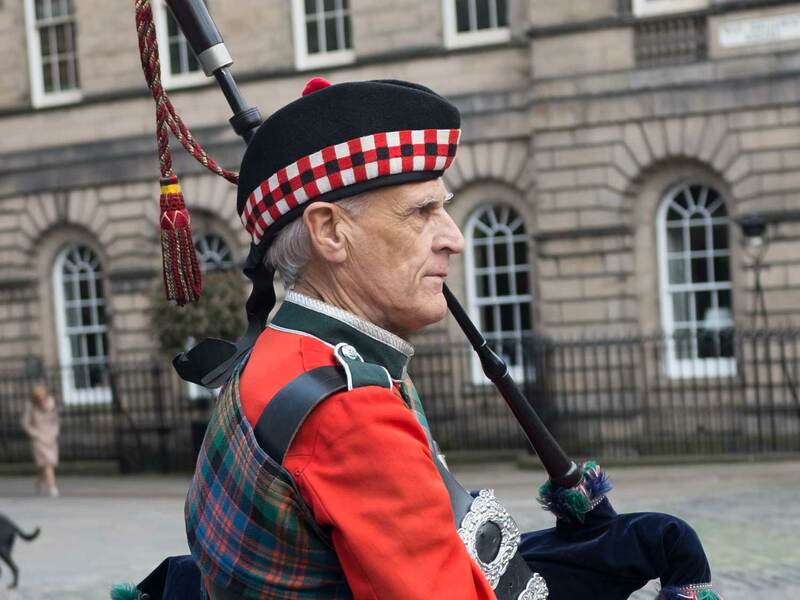 Having never seen a piper in Edinburgh wearing a red jacket, he explained that it was a military jacket and had cost him £500.00 and that he used to collect funds for a hospice and the jacket brought in the crowds – that and his playing. He had terrific staying power when he played, with notes and sequences that just went on and on. He said he had been piping for 45 years and was thankful his lungs had held out. He said he used a soft reed which made it easier to play and that professional contestants and pipers in military bands used a hard reed to get more volume. Then he pointed to where the reed sits, and I was so surprised. I expected it to be up near his mouth, but it is buried at the far end of the pipe where it meets the bag. Who knew? That phenomenon in Camera Raw happens to me too, with my regular Nikon photos. I meant that my Nikon files spring into sharpness straight away. I can probably count to ten before suddenly the Fuji files go from blurry to sharp. It doesn’t happen ALL the time, but often enough. 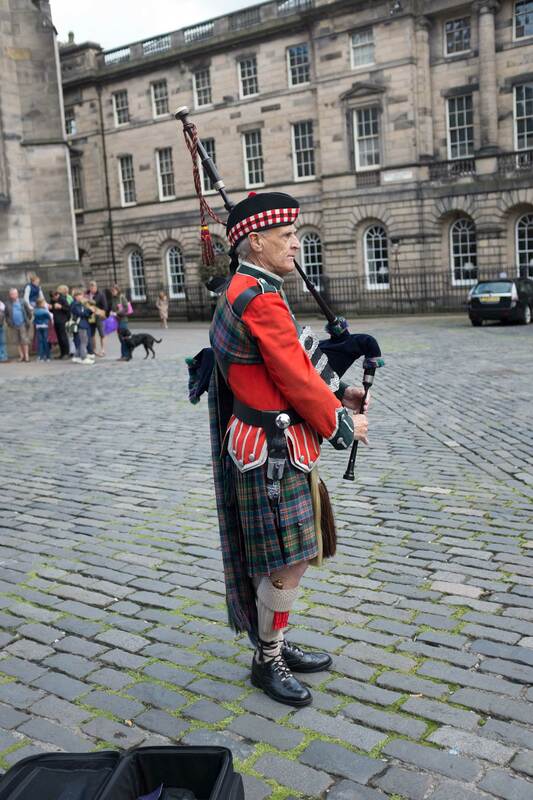 This piper makes a living by piping in the streets? I don’t know whether this particular piper does, but there is usually at least one piper playing somewhere in the city centre. I see them regularly so I get to know their faces – and I think they may make a living this way. It is probably worthwhile during the busy part of the tourist season, which started about six weeks ago and will go on until early September. Ok. But these pipers do not have a kind of band, group or organized way of piping? These people with little things live life so peacefully relaxed which keeps getting difficult with more possessions and more aspirations. My best wishes to them. Yes, possessions are a pleasure and a weight.